Development work and research still leave us with mind-blowing numbers: 12 million children worldwide are starved to death every year and 800 million people are in situation of hunger. Patrick van Damme stressed his attention of increasing population and energy consumption, and on lagging increase of grain production behind the demand trends. In order to address a solution to such problems, equalising income and educating both men and women are a “must”, according to van Damme’s presentation. However, these alternatives are difficult to achieve and might take time to yield results, therefore, it is necessary to additionally improve agricultural production, especially for the ones that, contradictorily, produce food. Out of all kind of help, Prof. van Damme underlined the importance of promoting local food production as one of the focal points to make food available and cheap, under the guidelines of agroecology philosophy. According to him, in agroecology “you take into account environmental parameters and conditions, you don’t try to bend them (in opposition to what he calls “modern” agriculture), you try to see how plots and crops can fit into those systems and you try to make the best of it and optimize production”. And examples presented by the keynote speaker clearly showed that improvements can be reached without GMO application: Maize yields more with intercropping, agroforestry provides better production of Cocoa plants, mixed farming system closes the system of nutrient cycle and offers better resource allocation - same well-known concepts of agroecology, agroforestry and conservation agriculture in action. 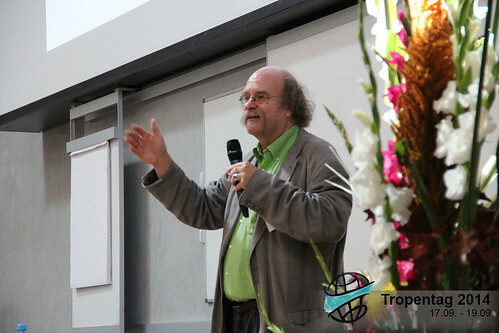 Moreover, Prof. van Damme indicated the multiple faces of agroecology: “Agroecology is a science discipline; it is also an agricultural practice and is even a social movement, with believers and non-believers”. During an interview with the Student Reporters team after his speech, he added details about his viewpoints, engaging with the political dimension of agro-ecology, and criticizing the approach led by GMO producers and big biotechnological corporations that, according to him, have large economic power that try to influence markets, setting prices and creating dependency on tropical farmers. Additionally, Mr. van Damme indicated that in numerous cases the application of scientific knowledge into practice comes along with political will of authorities and policymakers. Additionally, the involvement of actors with different approaches and interests make decision-making processes become more uncertain, so that, mistaken decisions might be made with uncertain results. Update: Watch the first part of the interview with Prof. van Damme here. The remaining parts will be uploaded and embedded here soon.